3.5 stars. I'm not going to go into any sort of summary or recap for UnStrung because there isn't much to break down when it comes to reading something the length of a few short chapters. If you're interested in why I think this series is badass, check out the summary for Unwind, the first book in the series. The description alone sells the book.Reading UnStrung didn't do much except to stir my enthusiasm for the upcoming book, as was probably the point. At first, I didn't understand why this "half-sies" story was even needed. Now, I'm curious as to why Mr. Shusterman felt we needed to know this brief cutaway glimpse from Unwind (when Lev is on the run). Perhaps, something or someone from this story is going to come back around in a big way in the newest book? There's not much to report because this is an extremely short blip in the world (although I still managed to get teary eyed from one scene...sigh). Don't read this if you haven't read Unwind already, or you will be extremely confused and not much of anything will make sense. I have the feeling that this trilogy will take over the top spot for favorite dystopia series when it's all said and done. 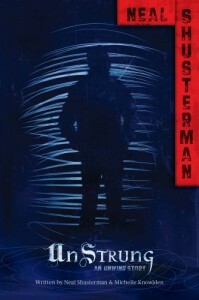 Unless book 3 drops the ball in a big way but I'm thinking probably not...Shusterman hasn't let me down so far.